Smithsonian Magazine has named Seventh-day Adventist co-founder and author Ellen G. White among the 100 Most Significant Americans of All Time. Smithsonian's list is based on the work of computer scientists Steven Skiena and Charles B. Ward, who analyzed massive troves of historical reputation data that derives from the English-language Wikipedia (which hosts over 840,000 pages devoted to individuals from all times and places) and from the more than 15 million books Google has scanned. Cambridge University Press published the results of their analysis in a book entitled "Who's Bigger? : Where Historical Figures Really Rank". The 379-page tome begins with an excursis of "people as memes," as the concept of a "meme" was described by Richard Dawkins in his 1990 book, "The Selfish Gene". "Who's Bigger?" analyzes historical figures from around the world, not just the United States. The book's Top 100 list of most significant historical figures begins with Jesus at number one, and ends with John Locke at one hundred. Skiena and Ward developed a complex algorithm for ranking historical figures by their historical significance, which they define as “the result of social and cultural forces acting on the mass of an individual’s achievement.” The ranking prioritizes Internet notoriety over individuals' achievements. That is, individuals' historical significance depends on the volume of extant online data available for each historical figure. [Skiena and Ward] analyzed this data to produce a single score for each person, using a formula that incorporates the number of links to each page, the number of page visits, the length of each entry and the frequency of edits to each page. Their algorithms differentiate between two kinds of historical reputation, what they call “gravitas” and “celebrity.” Finally, their method requires a means of correcting for the “decay” in historical reputation that comes with the passage of time; they developed an algorithm for that, too. By their reckoning, Jesus, Napoleon, Muhammad, William Shakespeare and Abraham Lincoln rank as the top five figures in world history. Their book ranks more than 1,000 individuals from all around the world, providing a new way to look at history. 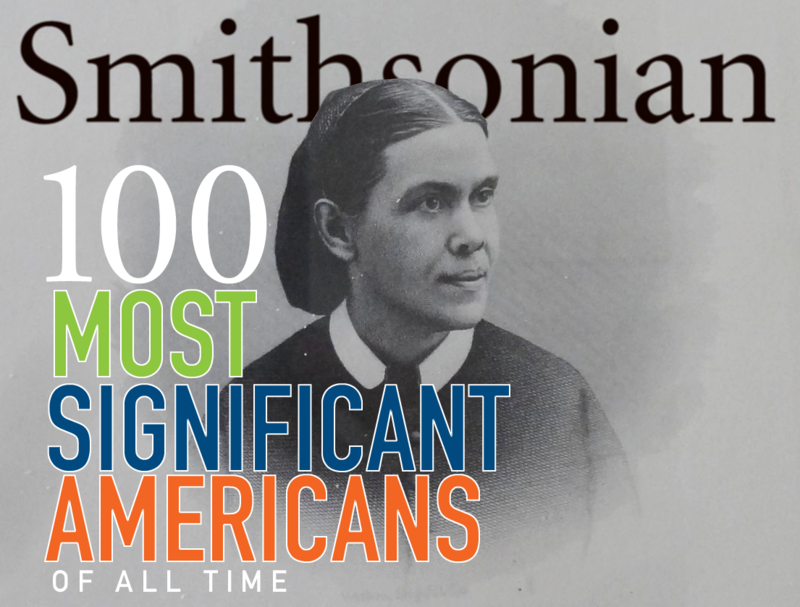 Smithsonian added their knowledge of American history to Skiena and Ward's work to create their list of the 100 Most Significant Americans in which Ellen White appears. Smithsonian senior editor Tom Frail wrote, "By synthesizing our expertise with the systematic rigor of Skiena and Ward’s rankings, we sought to combine the best of quantitative measures and qualitative judgment." Significantly, Smithsonian created categories deemed historically important, and after asking Skiena and Ward to separate American figures from their ranking of world historical figures, compiled a list of top ten in each category, adding a discretionary "Editor's Choice" selection in each category. White, whose 187th birthday was last Wednesday, November 26 (she died in 1915), was one of three women in the religious figures category and one of only 22 women overall. See Smithsonian's complete list of 100 Most Significant Americans of All Time. UPDATE: Since this article's publication, readers have inquired about the inclusion of Sojourner Truth in Smithsonian's list. She is listed in the "First Women" category alongside Pocahontas, Eleanor Roosevelt, Hillary Clinton, Sarah Palin, Martha Washington, Hellen Keller, Jane Addams, Edith Wharton, Bette Davis and Oprah Winfrey. Historians disagree over whether or not Sojourner Truth ever became a part of the Seventh-day Adventist Church. She attended Millerite meetings, interacted with Uriah Smith and other Adventist pioneers, but left no record of membership to history. She was an African-American abolitionist and women's rights advocate who lived from around 1979 to 1883.